Vaping has dramatically risen in popularity in recent years, and is increasingly seen as a viable aid to quitting cigarette smoking. Consequently, employers need to ensure they set out clear policies in order to deal with e-cigarettes in the workplace, particularly since official health advice now unequivocally states that vaping is at least 95% less harmful than smoking. Vicky Powell examines the work-related health implications of these trends. Vaping — how big is it? According to figures published by the anti-tobacco charity, Action on Smoking and Health (ASH), in September 2018, an estimated 3.2 million adults in Great Britain currently use e-cigarettes, up from 700,000 in 2012. There are now more ex-smokers (1.7 million) who use e-cigarettes than current smokers (1.4 million). This means that over half (52%) of e-cigarette users are ex-smokers with 44% being current tobacco smokers. Indeed, ASH says the main reason given by current vapers for use of e-cigarettes is to help them stop smoking. The law on conventional smoking in workplaces in the UK is clear. In terms of the Health Act 2006, the smoking of normal cigarettes is banned in enclosed or substantially enclosed public places, including workplaces. In England and Wales, anyone who breaches the smoking ban under the Smoke-free Premises, etc (Wales) Regulations 2007 could face heavy penalties. Employers, managers and those in control of premises need to display No Smoking notices and take reasonable steps to ensure that staff, customers, members and visitors are aware of the law and do not smoke in buildings. Similarly, in Scotland public places and workplaces became smoke-free under the Prohibition of Smoking in Certain Premises (Scotland) Regulations 2006. However, e-cigarettes fall outside of the legal definition set out by the Health Act 2006 and are not covered by the legal ban on smoking in enclosed workplaces. Therefore, it is up to individual employers to take action and set out a policy on the subject. Organisations in the UK take a widely varying approach to e-cigarettes. For example, while some London pubs allow for vaping indoors, others don’t. Some UK airports treat e-cigarettes in the same way as smoking, allowing them only in the designated smoking areas outside the terminal, as in the case of Heathrow Airport. In contrast, vaping lounges and e-cigarette coffee shops continue to be popular around the UK. Here, vapers can buy and use their e-cigarettes in a public place without breaking the law, despite the smoking ban having been in place for seven years. While initially there was some debate on the subject of the safety of e-cigarettes with health experts calling for a more thorough clinical evaluation, the advice from UK health authorities is now unequivocal. At the end of 2018, Public Health England (PHE) launched a new Health Harms campaign to convince the UK’s smokers that vaping is a far healthier choice than smoking and a good way to quit. In a move which may be helpful to managers responsible for facilitating employee quit-smoking programmes in the workplace, as part of its Health Harms campaign PHE recently released a new film on YouTube highlighting “the devastating harms that come from smoking, and how this can be avoided by switching to an e-cigarette or using another type of quit aid”. The film featured smoking experts Dr Lion Shahab and Dr Rosemary Leonard, visually demonstrating the high levels of cancer-causing chemicals and tar inhaled by an average smoker over a month, compared to not smoking or using an e-cigarette. However, recent research from the American Stroke Association emphasises that, while vaping is less harmful than smoking, e-cigarettes still carry increased risks to health — they are not harmless. Findings indicated that, compared to non-users, vapers had a 71% higher risk of stroke, 59% higher risk of heart attack and 40% higher risk of heart disease. The Advisory, Conciliation and Arbitration Service (Acas) has published guidance on the subject of e-cigarettes on their website, pointing out that since the devices fall outside the scope of smoke-free legislation, employers can choose whether to allow employees to use them at work or not. However, Acas warns that whatever the policy, employers should be clear about the rules. Employers therefore need to decide whether to allow employees to use e-cigarettes in the workplace or ban them as they would ordinary smoking implements. Acas makes the point that e-cigarettes are often used as an aid to stop smoking, so employers should carefully consider the implications for their own organisations when deciding what to do about e-cigarettes within their workplace. However, the conciliation body also urges employers to consider the effects on other members of staff as the long-term effects of e-cigarettes are unknown, and having e-cigarette vapours in the workplace may create an unpleasant environment. Acas suggests employers could include a paragraph about e-cigarettes in the existing policy document on smoking, drugs and alcohol, following consultation on the new rules with employees and their representatives. Furthermore, Acas advises that if e-cigarettes are allowed at work, line managers should be aware of who may be using them within their teams. Employers may want to put up signs or notices in the workplace which make it clear where smoking is allowed (if this is the case) and where it is banned, including rules for conventional cigarette smokers and rules for e-cigarette users. Although smoking is forbidden within workplace premises, organisations can still make certain areas available at work to be smoking areas. 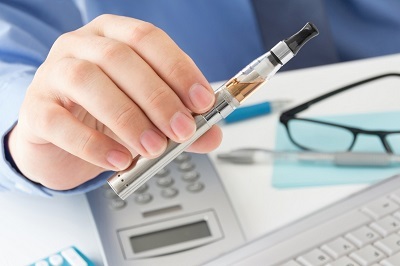 However, the practicalities of e-cigarettes may be challenging for employers. The TUC supports the idea that separate areas should be made available for users of e-cigarettes away from any outside smoking area. Acas advises that any policy should make the following clear. Any unauthorised or excessive taking of smoking or e-smoking breaks will result in disciplinary action. Any smoking of cigarettes or using of e-cigarettes in a prohibited area at work will result in disciplinary action. Smoking in a designated smoke-free public area is a criminal offence which will attract a fine. Finally, it should be noted that smoking in the workplace is dealt with as a public health matter in the UK, with the Department of Health, not the Health and Safety Executive (HSE), as the lead authority in England. (In Wales this is a matter for the Welsh Assembly Government and in Scotland it is the responsibility of the Scottish Government.) Local authorities, not the HSE, are responsible for enforcing the legislation.. However, the HSE will support local authority officers in raising employers’ awareness of their responsibilities and in encouraging employers and employees to comply with the law. HSE inspectors will also bring matters of concern to the attention of the employer, for example a failure to display warning notices. Acas guidance on e-cigarettes can be accessed via the Acas website. For detailed information and advice, see your Smoking at Work topic. Alcohol — how much is too much?